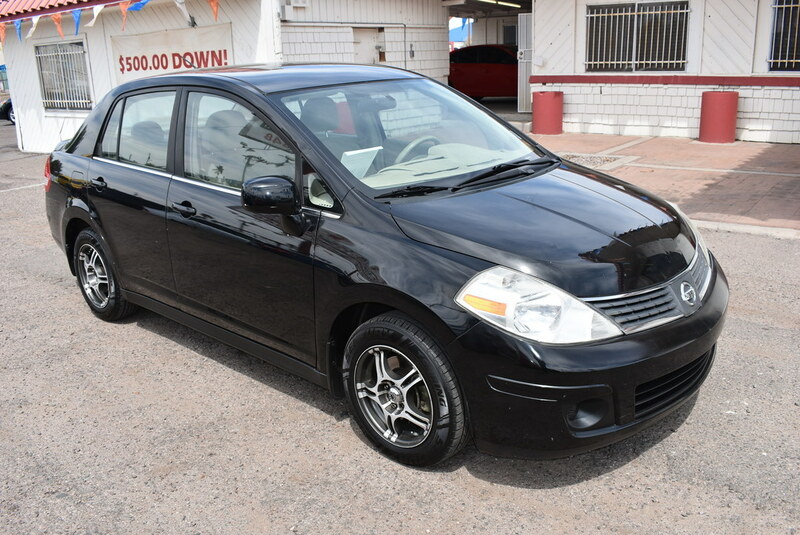 This 2007 Nissan Versa S offers style and comfort above and beyond what is expected in a vehicle this size. Our Nissan power plant starts with a 1.8 Liter 4 Cylinder offering one of the best values on the road. With the smooth shifting 4 Speed Automatic transmission, this Front Wheel Drive machine helps you break the 30mpg barrier with ease and gets you up to speed with very little effort on the gas pedal. Plus, it is just plain FUN! Check out the swooping hatchback design, the bright wheels, and the wrap-around tail lights. Our Versa S stands as one of the best values available in today’s market. So right now, you and your Versa lead the charge for value and efficiency with power rear liftgate, power windows/locks/mirrors, fingertip cruise on the wheel, a great audio system with CD/Auxiliary input. Check out our pictures of this sweet ride and you'll be sold! Safety features include child safety locks and plenty of airbags. This Versa is an ultra-clean well-equipped machine that sheds new light on what it means to be an economy car. You have chosen well - great safety features, awesome looks, and plenty of pep! Print this page and call us Now... We Know You Will Enjoy Your Test Drive Towards Ownership! 2 owners, accident free car per CARFAX!!!!!!!!! !